Washington (CNN) - The New Jersey assemblyman leading the state's legislative investigation in the “Bridgegate” affair said Sunday any talk of impeaching New Jersey Gov. Chris Christie or calling for his resignation is "premature." "We don't have enough facts to even get to that conversation," Democratic Assemblyman John Wisniewski said. 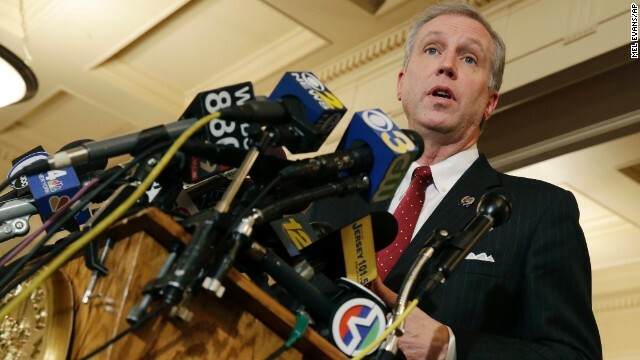 In an interview on CBS's "Face the Nation," Wisniewski told Major Garrett that the inquiry is still in its fact-finding phase as lawmakers try to determine what Christie knew about the reasons his aides closed access lanes leading to the George Washington Bridge. Though the state lawmaker waved off any discussions about impeachment or resignation as strict "hypotheticals," he left the door open to such drastic actions against the governor if the committee finds evidence implicating Christie. "We need to get all the facts on the table," Wisniewski said. "We need to make decisions about who knew what when. And when that's done, maybe it might be appropriate at that time to have that conversation. But clearly we're way ahead of that right now." The special committee subpoenaed 20 parties in January, asking former Christie administration officials and groups with ties to the governor to provide documents - including e-mails and text messages - that could shed some light on the burgeoning scandal. Those requests were to come due Monday but, in an e-mail to CNN, New Jersey Assembly Majority Leader Tom Hester said "numerous extensions have been granted." Hester's office did not indicate who received an extension or for how long. Earlier on "Face the Nation," former New York Mayor Rudy Giuliani punched at the legitimacy of the special committee's investigation into the affair. Giuliani said the process of sorting through who knew what and when will "take a while" and that "everybody's going to exaggerate" any news stemming from the investigation. Giuliani called the Wisniewski-led inquiry a "pile-on." "If he's lying, it's a really bad situation," the mayor said of the New Jersey governor. "If he's not lying, then something very unfair is being done to him." "So far, there's no evidence to suggest that he's not telling the truth. I think the governor knows the consequences," he added. Wisniewski hit back at Giuliani's statement. "He prejudged everything that's been said," Wisniewski said. "I haven't said that the governor has responsibility for this. I haven't said that the governor knew when this was happening. That's something (former Port Authority official David) Wildstein said." "What I've said is the governor made a statement about when he knew, and I said that I have my doubts about that timeline,” Wisniewski added. “He could've known at any time, but I have my doubts about what he said." In a report on its website Friday, The New York Times reported that Wildstein "had the evidence" to contradict statements Christie made at a January news conference. The newspaper later revised that report to say Wildstein's attorney contends "evidence exists" that Christie had knowledge of the lane closures while they were happening. Christie has said he was unaware of the lane closures until press accounts surfaced about the traffic snarl in October. On NBC's "Meet the Press," Wisniewski said evidence of Wildstein's claims was not in the more than 900 pages the former Christie appointee submitted to the state legislature. "We don't really know what the evidence is," Wisniewski told the show's moderator, David Gregory. "What he's talking about must be something other than what he submitted." Wildstein resigned amid allegations that Christie appointees had ordered access lanes to the nation's biggest river crossing in Fort Lee closed last year as part of a political revenge scheme. Where the heck is this impeachment stuff coming from? This is not a republican witch hunt where you are guilty even after proven innocent. Let the facts come out, after all, we still live in America, not some third world republican country. Issa should take notes as to how you conduct inquiries. Editing documents and releasing top secret documents to Sean Hannity has not served Darrell well. So pointing out Darrell Issa could learn from this about how to conduct an investigation is off limits? English translation: "Please, please, everyone keep talking about impeachment as much as possible." They may play hardball in Washington, but in New Jersey they play by Australian rules! It certainly is premature. Let the investigations run their course, let the witnesses testify. We need to give Christi a fair shake although it doesn't look like the GOP or Christi would do the same. Looks like the GOP is REALLY the garbage of America and anybody that votes for these fools should consider them selfs STUPID!!!!!!!! If he ever becomes President, I hope Christie is aware when his staff wants to launch a preemptive nuclear missile attack. New Jersey Gov. Chris Christie's come down after the Super Bowl 48 festivities will surly be painful . New Jersey politics is very hardball and somewhat brutal . You play you pay . I want to see Christie stay in office and finish out his term , why put another corrupt politician is his place . lesson dems do not fall into the Darrel issa repubs mode of convicting folks with made up facts. the repubs have been spewing this fake Benghazi, fake irs scandals, fake gun running stuff for 2 years now. do not fall into their evil guise of saying that facts doesn't matter. Christie, even though i feel hes guilty as hell, need to have a thorough investigation, and nothing less, before anyone start speaking of impeachments. and not this impeachment crap the far right loves to throw around, if this president sneezes too hard in public. let show them that the Americans people are still logical and rational people. Impeachment ?? Impeach Kriskpy??? Why? At this point there's no proof he's guilty of anything.. but that hasn't stopped the loony righty for calling for the same for the POTUS for many yrs.... you can't impeach someone because you don't like them. Slowly but sure, they will reach their goal though letting the heat go down makes difficult to revive it later. If this were happening to a democrat, the republican party would have had the person impeached, jailed, drawn and quartered, then set afire on the very first day of the crisis. But he's a republican. There seems to be a large double standard in our nation when it comes to crooks. Well said totally fair and reasonable at this time . When the subpoenas have been responded to on Monday and time is give to look at all that then it might lead to that question having a different answer. Unlike say ISSA democrats don't convict without proof or cheery pick evidence to make it look worse than reality like GOP House or senate committees.